The microprocessor is the main important or the heart of the normal computer. Generally, we will use the microprocessors like Pentium, AMD, power PC, or any other brands and types of microprocessors. The microprocessor is also called as a central processing unit. The microprocessor is totally computation engine and it is fabricated on the single chip. The Intel has released the first microprocessor in the year 1971 and it contains the 4-bit microprocessor and having 2300 transistors, 640 bytes of memory addressing modes and with a clock speed of 108 kHz. Generally, the microprocessor is an integrated circuit and it incorporates core function of a computer’s central processing unit. The microprocessor is a programmable multipurpose silicon chip, register based, clock driven, it accepts input as a binary data and after the processing, it provides the output data as per the instructions stored in the memory. Different types of microprocessors are explained below. The 8085 microprocessor is designed by Intel in the year of 1977 with the help of NMOS technology. 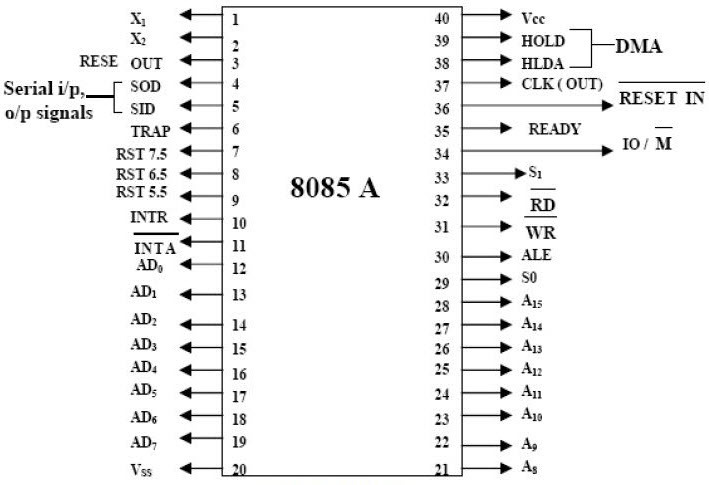 The 8085 microprocessor is pronounced as an eighty-eighty-five microprocessor and the configurations of this microprocessor are the 8-bit data bus, 16-bit address bus, it can address up to 64kb, 16-bit programmer counter & stack pointer, the six-bit registers are arranged in the pair of BC, DE, & HL. The 8085 microprocessor requires a 5-volt power supply. This microprocessor is also designed by the Intel and the 8086 microprocessor has a 16-bit microprocessor with 20 address lines and 16 data lines with storage of 1MB. The 8086 microprocessor consists of a powerful instruction set, which gives the operations like multiplications, divisions easily. 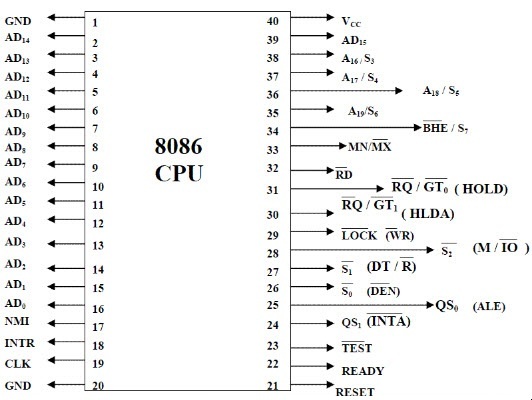 The 8086 microprocessor has two modes of operations, which are maximum mode and minimum mode of operations. The maximum mode of operation is used for the system having multiple processors. The minimum mode of operation is used for the system having the single processor. The features of this microprocessor are explained below. 1. To improve the performance of this microprocessor there are two stages of pipelining, which are fetching & execute stage. 5. It is the first 16-bit processor with 16 bit ALU & register, internal data bus and 16-bit external data bus. The RISC stands for Reduced Instruction Set Computer and it is designed to reduce the execution time by using the simplifying the instruction set of computer. In the microprocessor, each instruction set requires only one clock cycle to implement result at a uniform execution time. Therefore, it reduces the efficiency for more lines of code, hence it required an extra RAM to store the instructions. The compiler is used to convert the high-level language instruction set in a machine language. The following block diagram shows the architecture of the RISC processor and this type of processor is used for the highly optimised set of instructions and the applications of the RISC processor is for the portable devices like Apple iPod due to its power efficiency. The characteristics of this processor are explained below. In the RISC processor, there are simple instructions. It consists the number of registers and less number of transistors. To access the memory location the LOAD & STORE instructions are used. This processor has one cycle execution time. This processor is designed to minimise the number of instructions per program and it will ignore the number of cycles per instructions. The compiler is used to translate a high-level language to assembly level language because the length of the code is relatively short and an extra RAM is used to store the instructions. Some different CISC processors are following. The following block diagram shows the architecture of CISC microprocessor. It is designed to decrease the cost of memory because more storage is required in large programs resulting in higher memory cost. To overcome this number of instructions per program can be reduced by using the embedding the operations in a single instruction. The instruction coding logic is complex. The special processors are designed for some special processors and some of them are explained below. The coprocessor designed especially for microprocessors. It can handle it practical function for many times faster than the normal microprocessors. The example of the coprocessor is the math coprocessor and some of them are 8087 is used with 8086, 80287 is used with 80286, 80387 is used with 80386. This processor will have its own local memory. It is used to control I/O devices with the involvement of the CPU. The examples of the input/output processor are DMA control, keyboard & mouse control, graphic display control, and SCSI port control. 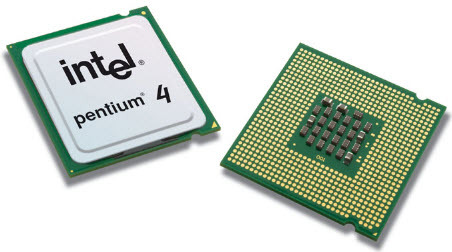 This processor is also having its own local memory and also having links to connect one transputer to another transputer for inter-processor communication. The Transputer is used for single processor system or it can be connected to external links reduce the construction cost and increases the performance. Some examples of this processor are floating point of processors like T800. T805, T9000. The components required for this processor are a programmed memory, data memory, input/output, and compute engine. This processor is designed to process the analogue signal to digital form. This process is done by some regular intervals and converts the voltage into digital form. The applications of this processor are sound & music production, video signal processing, and 2D & 3D graphics acceleration. The example of this processor is TMS320C40. 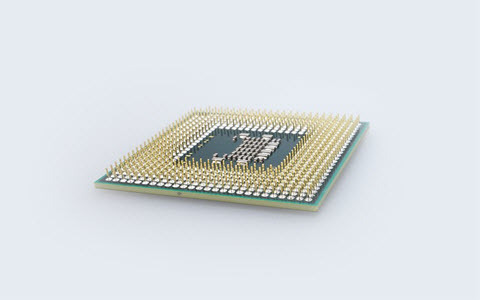 This article gives the information on different types of microprocessors and their uses. I hope by reading this article you have gained some basic information different types of microprocessors. If you have any queries about this article or about the implementation of Microcontroller projects, please feel free to comment in the below section. Here is the question for you, what are the functions of the different microprocessors?